Rodent Removal and Rodent Control is a common service handled by Animal Control Solutions throughout Alexandria, Virginia. Rats and Mice can be found living in attics, crawlspaces, garages, and in the basements of homes and business in Alexandria, VA and the surrounding areas. These pests have also been known to take up residence in sheds, barns, outhouses, and even in cars. Rodents such as Rats and Mice will seek any opportunity for shelter that will keep them from predators and have an available food source. Animal Control Solutions have the knowledge and the training to get the job done quickly and humanely. Rodents pose many potential dangers to you and your family as well as to your property. They have been known to chew through wires and cables leading to a potential fire starting. Rodents will gnaw on anything and everything. In some cases, we have seen decks and porches collapse from the deterioration due to the Rodents constant gnawing. Rats are very quick to breed and a small Rodent problem can quickly turn into a Rat infestation. 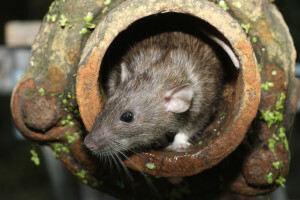 This is one of the many reasons that once a Rat has been discovered in a home or business, it is important to initiate the Rodent Removal process as quickly as possible. Animal Control Solutions’ Wildlife Technicians are equipped to handle Rodent Removal as well as many other types of Wildlife problems. Call 703-881-3170 today to schedule an appointment with one of our highly trained Wildlife Technicians.